You are a person worthy of love. You don’t have to do anything to prove that. You don’t have to climb Mt. Everest, write a catchy tune that goes viral on YouTube, or be the CEO of a tech start-up who cooks every meal from scratch using ingredients plucked from your organic garden. If you’ve never received an award and there are no plaques proclaiming your exceptional gifts hanging on your walls, you still deserve all the love in the world. You do not have to earn love. You simply have to exist. When we see ourselves and see life more clearly, we come to rely on that. We remember that we do deserve the blessing of love. A lack of real love for ourselves is one of the most constricting, painful conditions we can know. It cuts us off from our deepest potential for connecting and caring; it is enslavement to powerful—but surmountable—conditioning. And yet, no matter what bravery we show to the world, most of us have recurring doubts about our worth. We worry that we’re not desirable enough, good enough, successful enough. We fear we’re not enough, period. Intellectually, we may appreciate that loving ourselves would give us a firm foundation, one from which we could extend love out into the world. But for most of us this is a leap of logic, not a leap of the heart. We don’t easily leap toward things we don’t trust, and most of us don’t trust that we are worth loving. In fact, just the opposite is true. When the airplane cabin pressure is dropping, no one would call it selfish when a father secures his own oxygen mask before turning to help his child. More broadly, to love oneself genuinely is to come into harmony with life itself—including all others. Psychotherapist and meditator Linda Carroll explained the difference to me this way: “Loving yourself is holding yourself accountable to be the best you can be in your life. Narcissistic love has nothing to do with accountability.” In other words, when we cultivate tenderness and compassion for the whole of our experiences—the difficult and hurtful parts, in addition to the triumphs— we naturally behave more kindly and responsibly toward others. Our hearts soften and we see that each of us is, in our own way, grappling with this human life that Zorba the Greek called “the full catastrophe”—replete with wonder and sorrow. And so we begin with ourselves. We are born ready to love and be loved. It is our birthright. Our ability to connect with others is innate, wired into our nervous systems, and we need connection as much as we need physical nourishment. But we’re also born to learn, and from our earliest days, we begin to create our map of the world and our place in it. We form simple expectations: if I cry, someone will come—or not. Soon we start to weave fragments of our experiences into stories to explain what is happening to us and in the world around us. When we’re very young, most of these expectations and stories are implicit, encoded in our bodies and nervous systems. But as we grow older, they become more explicit, and we may be able to recall where and when we first received a particular message about our worth and about our ability to love and be loved. Excerpted from the book Real Love: The Art of Mindful Connection. Copyright © 2017 by Sharon Salzberg. Reprinted with permission from Flatiron Books. All rights reserved. Sharon Salzberg is cofounder of the Insight Meditation Society (IMS) in Barre, MA. She has been a student of meditation since 1971, guiding meditation retreats worldwide since 1974. 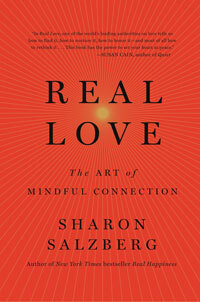 Sharon's latest book is Real Love: the Art of Mindful Connection. She is a weekly columnist for On Being, a regular contributor to The Huffington Post and is also the author of several other books including the New York Times best seller, Real Happiness: The Power of Meditation: A 28-Day Program, Love Your Enemies, Faith: Trusting Your Own Deepest Experience, Real Happiness At Work: Meditations for Accomplishment, Achievement, and Peace and Lovingkindness: The Revolutionary Art of Happiness. For more information about Sharon, visit: www.SharonSalzberg.com.